Wendy Pearson, writing for IMS ExpertServices, offers this article summarizing an expert witness' use of presentation technology in the courtroom - 3D printers, computer simulations, animated graphics, etc. It is hard to believe that in the year 2016 there are still judges that restrict use of high tech methods in the courtroom, but evidently it is so. Denying both sides the opportunity to exploit the most effective means available seems like a clear miscarriage of justice. Anyone old enough to remember when design reviews, seminar speeches, and other presentations to customers and peers consisted of overhead projectors, hard copy handouts, and occasionally a physical sample to pass around to the audience was stand operating procedure, can testify to the vast improvement realized by computer-based deliveries. Ms. Pearson cites one expert witness noting that his jury audiences tended to stay awake more easily when he used modern presentation tactics. Imagine being either the plaintiff or defendant and watching the panel and even judge struggle to maintain consciousness while information that affects your livelihood - and maybe even freedom - falls on deaf ears in the jury box. Maybe that is why we see stories of judges playing video games (or with themselves) during extended trials. BTW, the IMS ExpertServices folks recommend Effective Expert Witnessing: Practices for the 21st Century, 5th Edition, by Jack V. Matson, for anyone engaged in or wanting to be engaged in providing expert witness services. Google "technology in the courtroom" and you will get 15 million hits on topics such as iPads, animation, LCD projectors and touch screen telestrators. You will also find details on skyping in witnesses for testimony or using 3D printers to create demonstratives. These hits are all in response to the "technological tidal wave" crashing onto the legal system. They reflect the collective need of attorneys and judges to anticipate, adapt, and accept the latest gadgets, and employ them effectively, efficiently, and ethically. . . without drowning in apps, cords, and associated lingo. As noted recently in my article on essential apps,, attorneys are not the only ones in the courtroom with a need to be tech savvy – experts should be too. Not simply because it is the latest fad, but because well-presented data in concert with engaging testimony are part of effective expert witnessing. If technology can enhance that connection with the jury and make one a more effective expert, then it makes sense to embrace those tech tools. The minimum age limit to serve on a jury is 18. Therefore, it is important to know that millennials ("digital natives" as the Pew Research Center has referred to that generation) and generation Z (born ~1995 to today) are simply conditioned to learning through technology. YouTube videos, TED talks, and websites like Coursera, Udemy, and EdX all offer online learning opportunities covering a broad range of topics, ranging from educational to just plain fun. In addition, collegiate courses at many universities frequently feature professors who have traded chalk boards for tablets, or have created video-taped lectures to provide learning outside the classroom. Furthermore, online course enrollment continues to climb. In response, U.S. courts have started to integrate technology into the courtroom too. For example, the Jefferson Circuit Court of Kentucky upgraded to independent multiscreen displays, citing "recent university studies have shown that students' test scores improve by 14 – 15%, or one letter grade, when the course is taught with two or three different, simultaneous presentations compared with single screen content," (Michael, 2013). "There seemed to be a positive response to my use of modern technology vs. the opposing side's expert who was mired in pages of hand-written notes and grainy photocopies of radar and satellite imagery. I had nice crisp presentation-quality graphics. I noticed the judge and jury seemed less sleepy and more engaged during my testimony than during the opposing [expert's]. My attorney was also impressed because after going through my data and findings and comparing with the opposing meteorologist, she saw that I produced much more and better quality work for about half the billable time." Convey my "theme" or "narrative" better? Having answered yes to the above questions, there are basic things to keep in mind for using tech at trial. Thanks to others writing and blogging on this topic, there are some excellent articles and posts already out there, mostly written by attorneys (for example, see Tad Thomas' "Effective Use of Technology in the Courtroom" or Peter Ausili's "Federal Practice: Using Technology at Trial"). Technology may be rapidly evolving but that doesn't mean all courts are keeping pace. Certain judges may be tech savvy, while others are not. 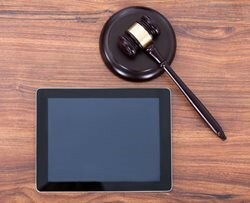 Different jurisdictions and even judges may have radically distinct rules regarding whether the use of iPads and other technology is permissible. Find out from the attorney before heading down the tech path. The attorney is not going to pay for your time invested in creating visuals that are not permitted in the courtroom. First and foremost: They don't need surprises, and neither do you! You will want to have ongoing discussions about your direct examination well in advance of your day to take the stand, regardless of whether you're using an abacus or an iPad. You and the attorney (or team of attorneys) will want to work together on direct examination, which includes how and when you plan to use demonstratives. Your conversations with the attorney should also include whether they hired a trial consultant or graphic designer, as well as the level of visualization they're interested in at different stages. Of course if you believe "X" technology will make your testimony more effective, you should make sure the attorney knows this - as it is your job to advocate for the best presentation of your testimony. Both sides typically exchange demonstratives in advance of trial. If you are creating your own, don't wait until the last minute, or you may not be permitted to use them in the courtroom. Don't let the technology that is intended to simplify, complicate. As Philip Sechler, attorney and professor from practice at Penn State Law observed in a recent article on his mock trial classes: "I've seen lawyers rely so much on technology they forget what it means to just be an effective, credible advocate for their client." The same goes for experts. Don't rely so much on the sleekness of your visuals that it affects your credibility, or detracts from your opinions and the concepts you want to convey.